Hello friends. I'm on Ubuntu Server 14.04 with ZM 1.29.0. Everything is running great, however I am having an issue with one of my indoor cameras. It's a Foscam 8910W acting as a baby camera for my youngster. It's 640x480 via MJPG. The issue is it does not look like the camera itself reflects its framerate setting with its output. (either that, or ZM is not seeing it properly). At first I thought the issue was a lacking feature in the rather bland firmware of the camera (unsurprising, given it's Foscam). Curious, I spun up a Windows system *just* to test an ActiveX login, as Foscam (frustratingly) seems to still cater towards IE specifically for configuring cameras (all I have here are Linux systems). Under ActiveX, I found the FPS setting, but here's what's weird. Regardless of what I set the camera's FPS to, it doesn't actually change it from ZM's perspective. It does however change the framerate in the IE web browser I'm using to configure the camera. If I change it anywhere from 0.5 FPS to 20 FPS, ZM still sees it as a steady 8-10 FPS, while IE itself shows the framerate speeding up/slowing down, as if it's listening to the FPS settings change. It's worth noting that streaming this camera in VLC directly reflects ZM, as in, neither ZM nor VLC change the rated FPS of the Foscam, no matter what I set it to on the Foscam. Even with it set to 1/2 FPS, it *clearly* is streaming frames significantly faster than 1/2 FPS with both ZM and VLC. Yet again, in the IE web interface, I see it change accordingly. This makes me wonder if the camera is trying to pump out too many frames over wireless than what it can actually provide. With me seemingly at a loss for not being able to control the FPS, I'm wondering if setting the maximum FPS in the settings of the camera is acceptable. I read the help text and I've been advised in the IRC channel that max FPS should only be set *if* it's above the camera's FPS setting. I did end up setting this setting, and so far it's good (but it's only been a half hour). With all of this said, I'm curious what you folks have to say about it. Is my assumption about the camera possibly accurate? Is maximum FPS something that might serve a non-consequential use here given the goofiness of this camera? Is the log entry above of any other suggestive fixes I haven't considered/thought of? Thanks ahead of time for any and all suggestions. Loving this project! Re: Is Max Framerate my only choice? Here are some Foscam settings I have saved from an old project.. Thanks for your quick response! Just to recap, before I posted here I actually set my max framerate (via source tab in ZM) to 5 FPS. The camera itself was clearly pushing more than that, so it was ZM in this case keeping the FPS "at bay" and steady at 5 FPS. In 3 hours, I did not have that error pop up again in the logs. A half hour ago I saw your post bbunge, but sadly within a half hour's time the exact same error popped up in the logs. I had added rate=11 to the path. Sure enough, it worked in the sense that ZM detected a steady 5 FPS flow, but as mentioned the error still came up. Just for a little extra, I restarted the ZM service and will watch to see if it surfaces again. If it does though... I can't help but to think that earlier, ZM ran for 3 hours without a single error (when the camera was set to max FPS, yet max framerate in ZM was set to 5). Previously I was averaging 2 or 3 of these errors per hour. It makes me wonder if that's the route to go. My only hesitation is the fact I've been told + read that using max framerate in ZM can lead to issues if you're using it to limit the camera's framerate. Is that something I should even concern myself with given this situation? Am using &rate=11 on four cameras, remote mode, with No errors. That is a Foscam command not Zoneminder. Are one of those four camers an 8910 by chance? Just an FYI one of my other cams is a Foscam wireless camera as well, but a different model (9821). This camera has never had any issues, as it's only been this 8910. My 8910 is set to remote, which pulls mjpg. My 9821 is an H264 camera, so it's working with ffmpeg. Also, potentially dumb question, but should a user reboot the ZM service after making changes such as the source path, etc? PS bbunge - do you find yourself using montage for long periods of time? Only reason I ask is if it wasn't for the camera locking up in montage, I would *never* know there was any sort of issue as everything else is flawless. 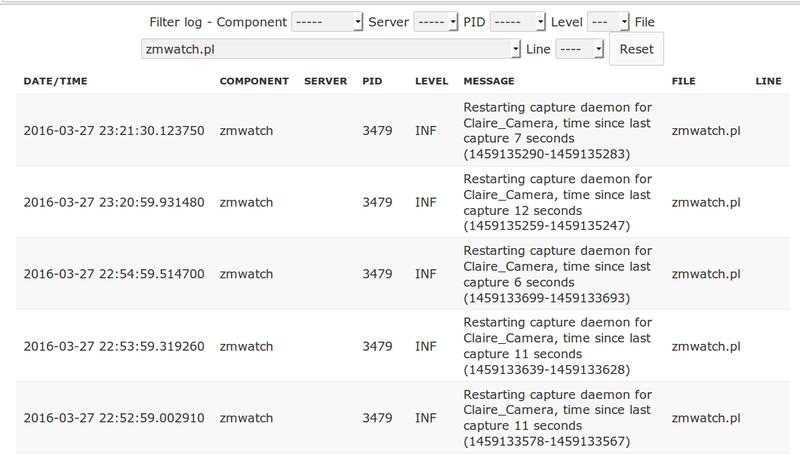 I only caught on to this after I filtered my logs for zmwatch.pl and saw the "Restarting capture daemon for abc-xyz" entries. EDIT - Just got hit with "Restarting capture daemon..." 5 times in a row. This was with &rate=11 in the source path and a blank max framerate in the ZM camera settings. Unfortunately that doesn't seem to be the ticket here. EDIT V2 - Before I checked in for the night, I changed the source path back to excluding &rate=11 and set max framerate to 5 FPS. This morning, I had no errors. I didn't review footage to make sure things were smooth but I took the lack of error logs as a good thing. I noticed in the help text that ZM provides that older IP cameras might prefer having this set. I wonder if the FI8910W is considered an older IP camera as per ZM's view? The Max FPS and Alarm FPS should be (blank) unless you have a Local camera. Yes, I have several 8918's which are the same as the 8910. I've tried setting the Analysis FPS to 1.00 and 1 but with blank Analysis FPS & Alarm FPS, it shows the Source (i.e. ip address) in ZM Console as red. No events occur . This is with ZM 1.30 & Ubuntu Bionic. I've tried 'sudo service zoneminder restart' but doesn't help. Just realised that this should be under version 1.30.